Office Syndrome is a modern day term used to describe office workers who suffer muscle and pain from sitting in a fixed posture for long hours without healthy movement. 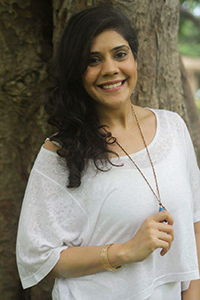 In this digitally connected world, it is an inevitable part of our life to get online for both work and personal reasons yet it comes with side effects such as fingers and wrists locked, neck and shoulder pain, uneasiness in our backs, blurry eyes and headache, for some it even affects the bladder. Mentally and emotionally, being online for hours can also drain our energy and tired our mind causing us to feel stress, sad or even sleepless at night. Although I am a Yoga Instructor with an active lifestyle, one major part of my job requires me to sit for long hours in front of my laptop doing research and connecting with clients. I find that after a few hours of sitting in a fixed posture, I start to feel heavy on my shoulders and pain on my left lower back. I instinctively knew that the way I sit, the hours that I sit and the amount of movement that happens in between those hours all have an effect on the level of uneasiness in my body. After much exploration, I find that adding healthy mindfulness and movement in between the hours of my work helped to ease the pain and lessen the effect of ‘Office Syndrome’. It is so easy for us to skip from work screen to our personal screen even though we are on a ‘break’. Set a fixed time in the day for yourself to have an ‘offline hours’. It doesn’t have to be the whole hour, perhaps you can start with 5-10 minutes every 3-4 hours and have a longer off time to connect with your family and friends face to face. Breathing is found to be one of the most relaxing and rejuvenating exercise we can take. It not only helps to relax the body but it rejuvenates the mind which is really essential in today’s busy world. The first breathing that you can try is the full Yogic Breathe. You can do this easily by placing your left hand at the heart center, right hand at your lower abdomen then start breathing deep breaths. Feel your chest expanded and abdomen rises with every breath that you inhale, feel it contracts with every exhale. You can do this anytime and for as long as you want until you are fully relaxed. 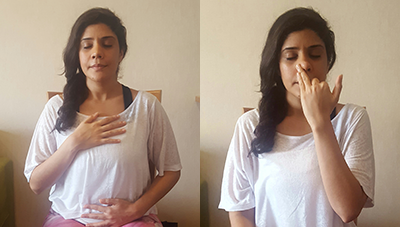 ‘Anuloma Viloma’ or Alternate Nostril Breathing is another breathing technique that is used in Yoga to help bring peace and tranquility back to our brain and body. Fold your index and middle fingers, close your right nostril with your thumb and begin to inhale through the left nostril. With your ring finger, close your left nostril and exhale through the right nostril. Begin to repeat this alternate nostril breathing for at least 2 minutes. You can do this in the morning or during the day, preferably empty stomach. You can try moving right now even when you are sitting on the chair at work. Simple neck turns side-to-side helps to feel more awaken, if you would like to go further you can begin to roll your neck in circles on both sides for 3-5 rounds each side. 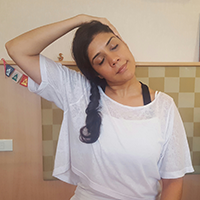 Turn your head 45 degrees to the right side, bring your right hand to catch the back of your head and gently press your chin down to your chest. This helps to stretch the side of your neck. 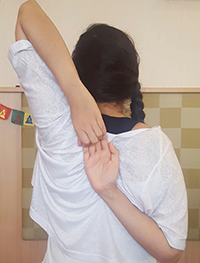 One of the asana or pose that can help stretches the chest and shoulders is a modified version of ‘Gomukhasana’ or Cow Face in which you can do at your chair just by doing the arm variation. Reach your right arm up towards the cieling, bend your elbow down towards the back of the neck with our fingers point down. 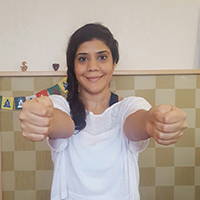 Bend the elbow and hands up to reach your right hand to clasp the fingers together. If this is not possible, you can also use your shirt to be the help, however, if you have a small towel nearby that would be most helpful. Relax your neck and lift your chin up to be in neutral positon. 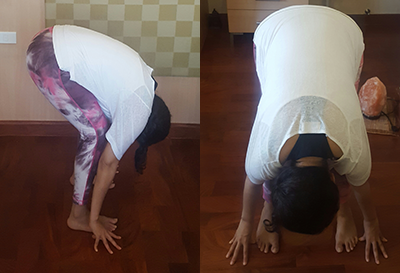 Come into a modified version of ‘Uttanasana’ or Standing Forward Bend whenever you feel like stretching your body. Begin with micro-bending your knees and simply fall forward down as much as you can. There is no need to stress if you cannot touch your toes, just as long as you feel comfortable. You can also think about grabbing your elbows and rocking your body side to side. This pose or asana, helps to relax your mind, relieves stress, aid digestion while stretches your hamstrings and hips. Stretch your arms forward, make a fist with your hands and start to roll your wrist in circles as many times as you can and slowly reverse to the opposite direction. Not only does this help to release any tension in your wrist but it also help to strengthen your arm muscle in a gentle way. Add a breathe to all movement, this helps to relieve tension in the body and also in your mind. Complete the exercises on both your left and right side to give balance to your body. You can add in a self-massage using different essential oils such as Peppermint & Lavender to help soothe and to be in that relaxation. Self-massages is a great way to also give yourself love and support to get through the day. Make it a point to walk more whether it is walking to see your colleagues instead of sending them a text or walking up the stairs instead of taking an elevator. While all the Yoga Asana & Pranayama and techniques above are found to be helpful in easing the effect of ‘Office Syndrome’ it is recommended that you visit specialists should your condition persist or is at a chronic stage for consultations and treatments.